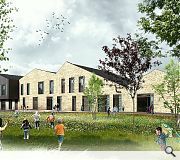 City of Edinburgh Council has filed plans for a new build primary school for the south east of the city at the intersection of Burdiehouse and Frogston Roads. 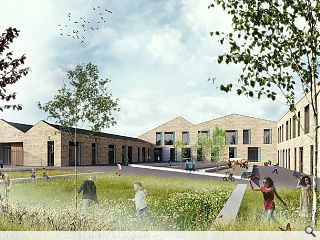 Broomhills Primary School has been designed by Holmes Miller Architects to include a nursery and shared space, with each element having its own separate entrance. 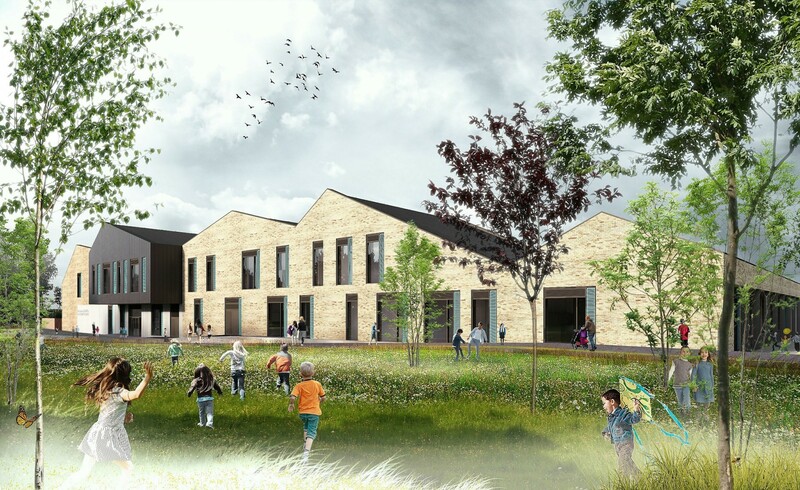 Inspired by the Pentland Hills the chosen form for the school adopts an undulating silhouette with the facade serving as a ‘civic front’ to newly formed parkland. In a statement the architects remarked: “The undulating quality of the Pentlands was a great source of inspiration for the design of the building. The Pentland Hills form an area of high ground which rises above the surrounding landscape. The highest summits and peaks (Scald Law, West Kip, East Cairn Hill and West Cairn Hill) appear to merge into each other creating this undulating effect at the top of the hills. 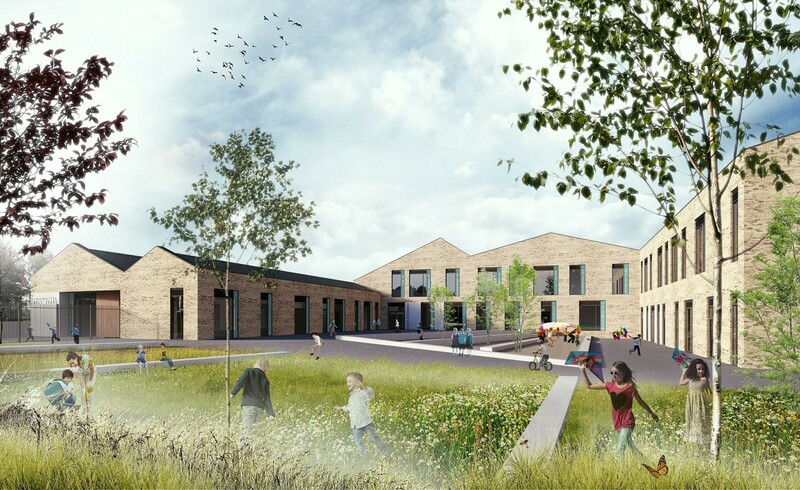 Utilising a dark grey zinc or zinc-effect roof with a facade dominated by buff brick and precast concrete panels the school seeks to defer to neighbouring residential development whilst emphasising its own civic nature. OMG -- no, no and thrice no. Just what is it today with the Shed 7 design vibe? Then there is the complexity that is not needed, the lack of scale and the forced / phony / faux attempt at history through planned inconsistency. File under poorly executed dross. Having gleaned the D&A statement, I find that this is an appropriate, cohesive, restrained and contextual response to the site embracing both the natural and built suburban environment. The D&A statement is in itself a model of clarity. I have to ask - Complexity? Where? Lack of scale? Where? Planned inconsistency? Where? I do wonder what FBoT's actual background is. Journalism? Or, maybe he'd be more at home with the Taliban. Even then, I'm sure all that will have been considered. All in all, a good decent high-quality proposal. D&A Statement -- Did they ask for a dog's breakfast? Because that is what they have got. #4 I agree with you, but re. FBoT I'd suggest just not taking the bait and ignoring him - he's an old-fashioned sh*t-stirrer in the model of Big Chantelle, formerly of these parts. PS @UR - why have you put an apostrophe after "Burdiehouse and Frogston Roads"? It was an incorrect application of the plural form! Instead of using precast concrete facades panels GRC panels could be used. GRC is lighter than precast concrete (less dead load on the structure) and easier to install. I really like this. The simplicity of the materials/ colour palette and the window form.